HI! Welcome to our store. When you walked in, did you hear that little bell jingle that we rigged above the door? Didn’t think so. We couldn’t find the right digitized sound effect. Mostly, we couldn’t find a door! What we did find is some stuff for you to buy if you like us enough to spend your hard-earned cash on our offerings. We hope you grab a few downloads, a whole CD, or a t-shirt or two. Mostly, we hope that you share this stuff with your friends. That’s how you can spread the CFN word and help us keep making music. Our first full album! Includes Felicity, The First Step, Believe, There Was a Time, Ignorance, My Sorry Soul (I Don’t Know), Getting Over You, Touch Me, Star Crossed, and Breathe for You. $10 Price includes shipping. Or, download the sames tunes now on iTunes. 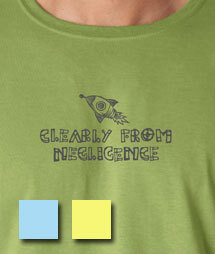 Your very own CFN t-shirt. The best of both worlds for less loot! 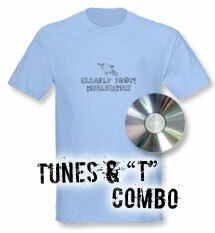 Buy the CD and a t-shirt and save five bucks! Want a CFN CD in a SOCK? Then go to a show! We throw 'em. You catch 'em. They're FREE (and laundered to remove the sweaty smell....jk).